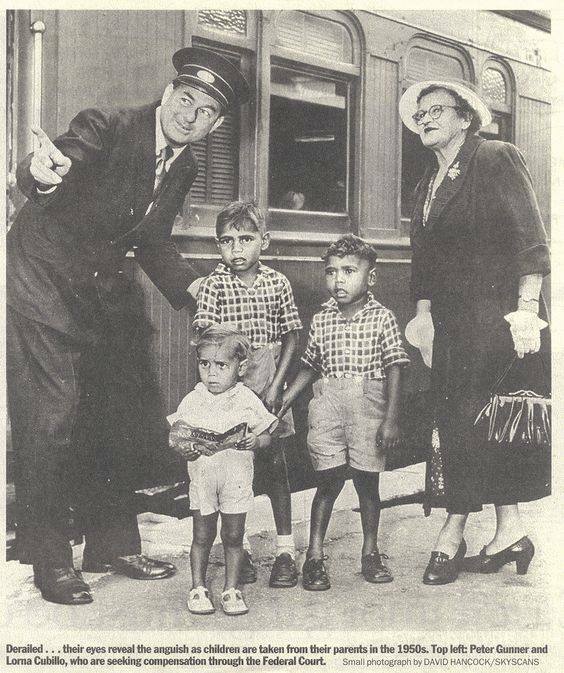 For whatever reason, and it may have been a sound reason at the time, these Aboriginal children have been removed from their parents' care and into State care. Or it could be that they were removed from the parents because they are half caste. They probably went on to be fostered by a white family or families. If they are siblings, I would like to think they were kept together, but often enough they were not. They have friendly and caring adults about them who were thinking they are are acting in their best interests, but I think the children were, to say the least, a little bewildered and I am sure I can see fear of the future, insecurity and maybe even terror in their eyes. I really hope things turned well for them, but I fear not, especially as two of them are suing the government. Later edit: This is speculation on my part from limited knowledge. It was mostly half caste Aboriginal children, that is ones with white blood, who were removed from their families. The full bloods were left alone with the hope by some that the race would die out. Generally the children's bellies were filled daily and were cared for by their family and more importantly normally a huge extended family who would ameliorate the behaviour of family members who has taken up bad white man habits. They may or may not have received a traditional white education but would have learnt Aboriginal ways and survived as their ancestors did in this land we call Australia for over 400,000 years. Aboriginal kids always had an auntie to go to, who would be firm, fair, just, caring and loving. South Yarra Station is mega busy with three sets of dual tracks passing through the station to service four train routes. It is also a major transfer point for passengers from train to tram and vice versa. It is perhaps the second busiest station outside of the city, Richmond being busier. In peak times this sole entrance is very crowded as the trains also bring in masses of school children too. 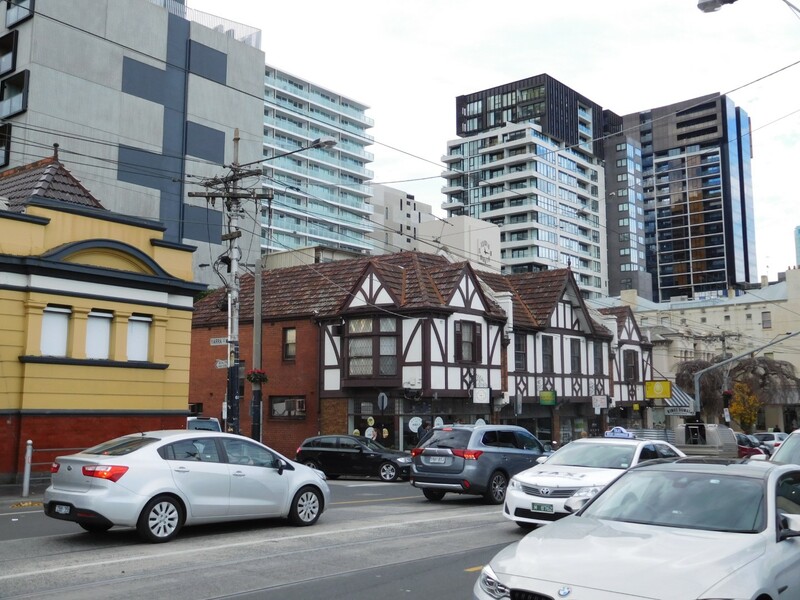 New buildings mocking the mock Tudor buildings. It is Sunday morning so things are pretty quiet today. 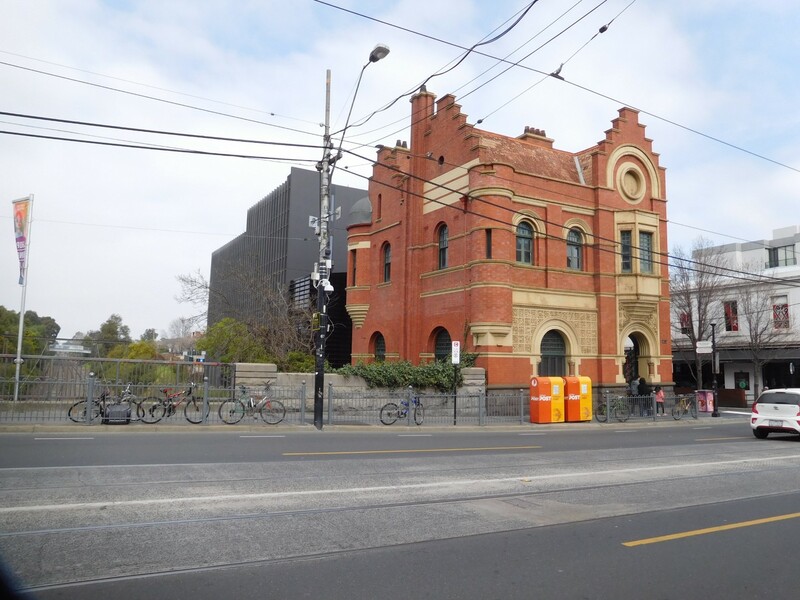 Just at the side of the station is what I think an old electric substation, perhaps for trains, but more likely trams. 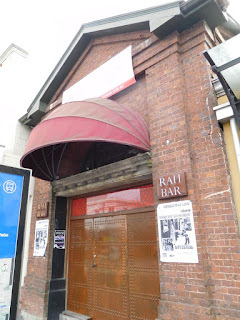 It is now a nightclub called Rah Bar. It has a very cool Moroccan themed interior. There are some photos here. It is much larger inside than it appears. 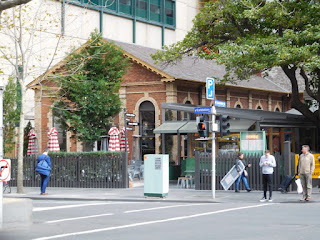 Later: I have just remembered there was a tram electrical substation nearby and I made mention of it in this post about Le Louvre, an upmarket frock shop which reopened in the substation. 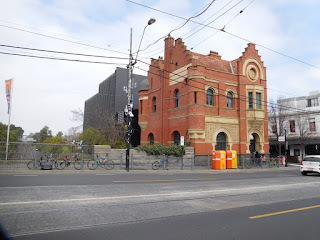 At the side of bridge over the cutting where the trains travel is the old South Yarra Post Office. 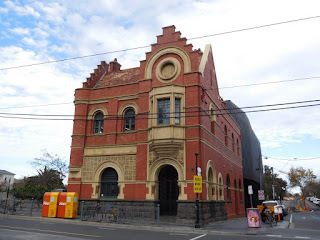 There is now a miserable little post shop somewhere in Toorak Road. A new building was bulit connected to the rear and was controversial at the time, but I think it works well enough. 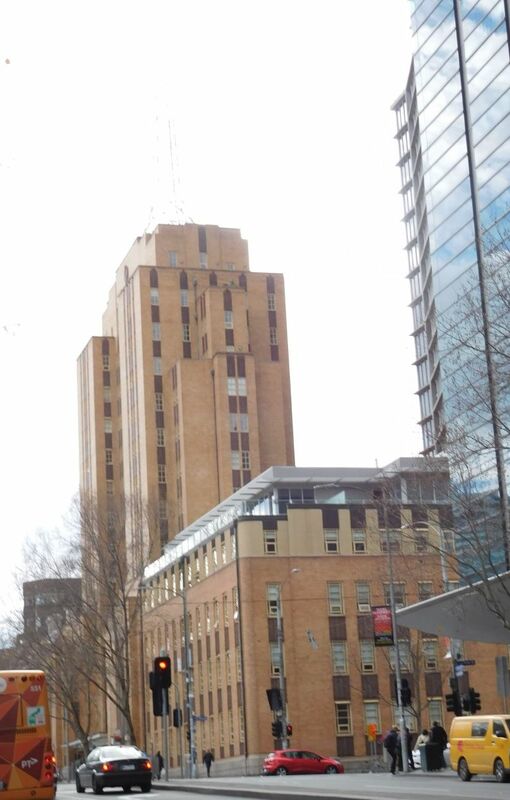 It doesn't dominate or tower over the old. Both the old and the new hold commercial premises. BAD is on Pitcairn Island. 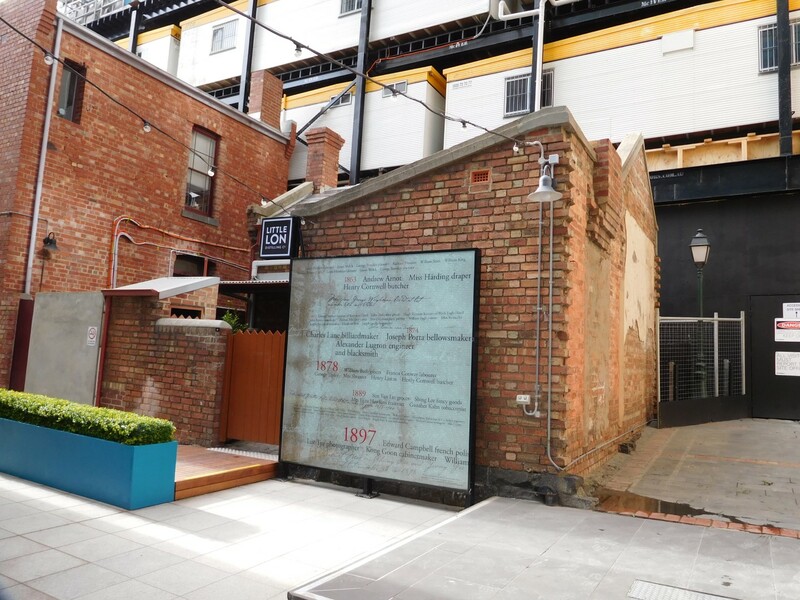 The area around north of Lonsdale Street in the city, between Exhibition and Spring Street, extending up to Latrobe Street was in mid 1800s to the early 1900s an area of vice. An evangelist described it as 'a loathsome centre in which crime, gambling hells, opium dens and degraded Chinese abound, and where hundred of licentious and horribly debased men and women are herded like swine'. (Sounds like it might have been a fun place to visit.) Yet it was also the most cosmopolitan area in Australia and had some kind of sense of community. 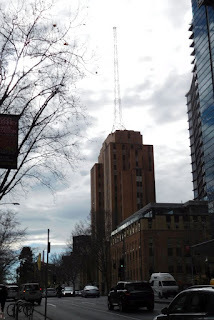 Many of the buildings were destroyed in slum clearance and before highrise residential buildings started going up, archaeologists turned the area over. I may revisit and take some more photos, especially as I know more about the area now. I really just had a look around during this visit. This is the rear of a gin distillery. Marie in London now knows a thing or two about gin. Little Lon Distilling Company now occupies this former brothel, once 'the workplace' of an Asian prostitute called Yokohama. It is the last remaining single storey house in Melbourne. The distillery opens as a bar three evenings a week and the stihl is named after Yokohama. Surrounded by high rise buildings and construction, a few original places remain. 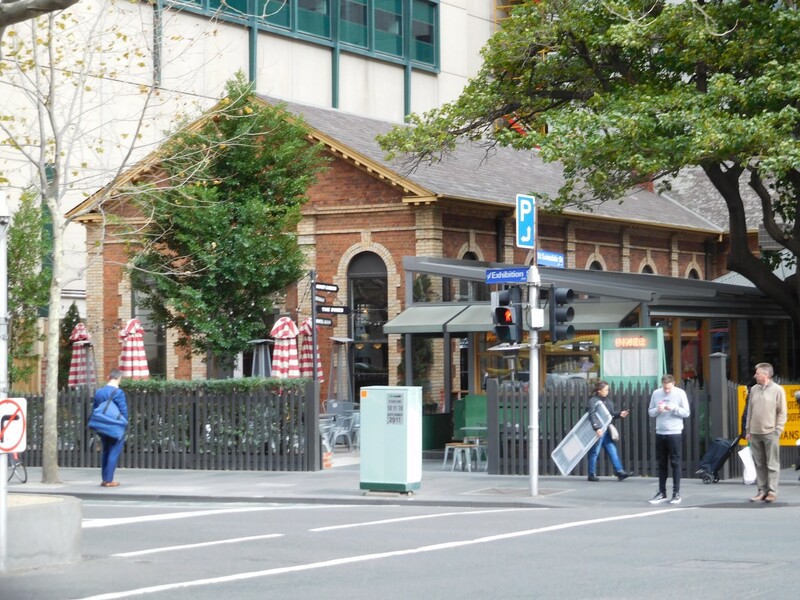 I am now at the corner of Little Lonsdale and Exhibition Street and this is Trunk bar and restaurant. Hey, this too looks like a single storey house, but no. It was built as a synagogue and Jewish school. This is the old Russell Street Police Headquarters, with its radio communication system, D24, antenna reaching far into the sky. It has been converted to apartments and I wish many more older buildings were converted rather than demolished. It was also the site of a massive bomb blast in 1984, with 21 people injured and one female police officer killed. I was in the city on the day and I remember the constant wail of police car and ambulance sirens, without knowing the reason. You can't see the antenna? Try this photo then. "D24 to all cars. We have a disturbance at......"
BAD has left Easter Island. We are being abused severely by big business and small business and fly by night sharks. Our local councils, our state governments and our federal government should be protecting us against such assaults with practical and enforceable laws, but none are. In my youth they were called tips, a place to dump rubbish. There is a huge one in Melbourne's north west and it is an ecological disaster waiting to happen. Ownership of the rubbish dump is somewhat mysterious, but the owner of the business has now washed his hands of any responsibility and sailed off to the delightful Whitsunday Islands on a yacht. I expect it will be a multi million dollar clean up, funded by taxpayers, just like we paid for the clean up of the north western state tyre fire hazard dump. Where is the owner of the land? Overseas, I expect. That foreign people and foreign corporations can own Australian land is open for question. You will not see that in Asian countries, nor many other countries. Dead fish, eels and other critters are strewing our beaches. A warehouse where all sorts of dangerous chemicals and dangerous potions were being stored. The warehouse went up like a Hindu widow and poured toxic smoke and fumes in all directions. I saw with a northerly wind the toxic cloud travelling south. The run off from the fire fighting efforts poisoned the local creek with some really bad stuff, hence all the dead water creatures and possibly some birds too. Now we discover some of our honey is adulterated with some kind of sugar syrup. We don't even have the equipment in Australia to properly test honey and the tests had to be done in Germany. Governments on all levels, you are supposed to protect us against such things, with rules, regulations, inspections and enforcement. The shonks don't stop at businesses. We have politicians as well, like Federal Minister Peter Dutton who brought about the downfall of Prime Minister Malcolm Turnbull. As Minister for Immigration he intervened three times when when au pairs on tourist visas were denied entry by the immigration department at airports. Two of the three where he personally intervened were donors to the political party he is part of and the third to was a former work colleague of his. Not fit for office at all. Then there is the exercable Leader of Her Majesty's Opposition in the State of Victoria, Matthew Guy. He made poor decisions about rezoning land and approving high rise buildings in breach of normal standards and 'coincidentally' many of the decisions have benefited donors to his party. He is not a fit person to be a political representative in our state, let alone be Premier of our state. My birthday is October the 14th. Write yourself a reminder note to send me some cash to keep me fed and watered, and some new tech toys for the boy. But a better birthday present would be for you to complain, complain often and complain loudly. Make what you think is right known to all. Whether you are a conservative or progressive voter, keep on complaining and whingeing, send letters and emails about what is unjust in your life, your city or your world. Changes and a better world will only come from those who fight and challenge. It lighter news, I just spoke to Tradie Brother. He is visiting Step Mother and her partner in the north of the state. He said he has some great photos of his dog, including one of him, the dog, coming out of the Bendigo Cathedral but he has not had time to upload them to Face Book. If it was important, I would contact the right people who would know, that is the St Kilda Historical Society. I have just rejoined the society with the idea that it can occupy some of my time when I retire. But I knew I could do it myself with just some time needed. 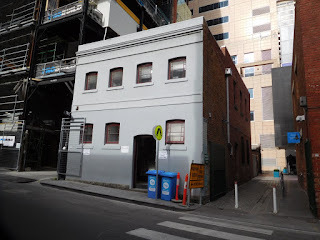 Remember this fairly recent post about Madame Brussels, a high end brothel keeper who operated in Melbourne in the late 1800s into the 1900s. I expect she paid the right people and had some kind of protection. No doubt some of her clients were politicians and it is suggested the visiting Prince Alfred, Duke of Edinburgh, spent some time as a guest of one of the high end madames, maybe Brussels. 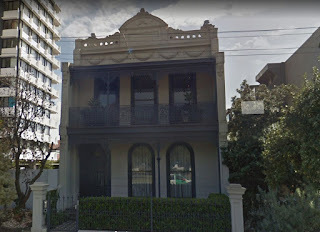 Madame Brussels owned two substantial homes in Lonsdale Street in the city along with a couple of modest cottages in the back lanes and she also bought a house on Beaconsfield Parade, St Kilda. While researching I saw mention that the house still existed. Of course I wanted to see which house it was but there was not a house in that beach front street with that number in St Kilda. Ok, the street has been renumbered at some point. I let the matter go to the back of my mind, in the too hard bin, maybe to find out in the future. 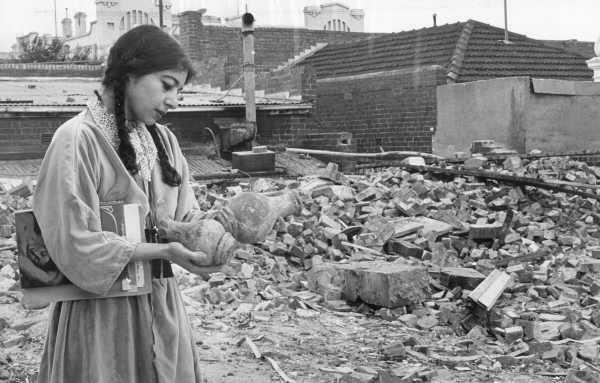 The recent death of Mirka Mora saw me back checking the accuracy of what I wrote after seeing her in this photo amid the rubble of a former French embassy in St Kilda. I wanted to double check a couple of the things, and so I turned to the marvellous Sands McDougall directory. It then occurred to me that using the directory I might be able to find out which house Madame Brussels owned. Bingo, there she is, Madame Brussels aka Caroline Hodgson at number 39 Beaconsfield Parade, St Kilda in 1900. Now, what I need to do is go forward with the directory that is available in five year intervals. This was not easy and I was on steep learning curve about how to search Sands McDougall online, in spite of me having used it before. Right, Beaconsfield Parade was renumbered between 1940 and 1945. Dam, the directory changed direction. Instead of going from east to west, it went west to east. I was hoping the same resident was still in the renamed property for the five years, but no such luck. So comparing the two two lists, and changing direction I established that Madam Brussels lived at 335 Beaconsfield Parade in St Kilda. Wow. Madame Brussels lived with her daughter, who attended a private Catholic girls' school, right next door to where our Hair Dresser Friend lives and where R lived for a time in the 1970s. Photo from Google Street View. I immediately texted Hair Dresser Friend about her former 1900s neighbour. She replied, snot nosed kids. Parents own (delete name) a chain of cheap clothing shops (think Cotton) and live there during the week, I assume while their children attend school, otherwise they live in a large regional town. Madame Brussels not only had had a good eye for what worked for men in their aroused and vulnerable state, she had a good eye for real estate. Her former home is now worth around $3,500,000. With nice views of the grassed road median strip and a bit of Port Phillip Bay. Maybe it's bay views from the second storey are ven better. What kind of nonsense writing is this? Karl Stefanovic is a popular television presenter but how do you dupe paps in vain? I have no idea what this is about and no interest since a supposedly professional media organisation wrote such tripe. Karl Stefanovic fiance's attempts to dupe paps in vain. The problematic African immigrants were at it again, just like problematic white 4th generation Australians were up to even worse behaviour near where my sister lives on The Bellarine last weekend when police were assaulted. But really, the pedestrian obtained serious leg injuries? It is technically correct I suppose, but ugly ugly English and to be only expected to be written by someone whose first language is not English and they are not English perfect. I am not a fiend about writing correctly. I hardly could be because I often get things wrong, but then I am am not a paid professional writer or journalist. It doesn't take a total rewrite. The pedestrian suffered serious leg injuries would do quite nicely. This from a newspaper I pay $25 a month to read. The incident was complicated by a vehicle crashing into parked cars and then hitting a pedestrian in the same area as the brawlers. The pedestrian obtained seriously leg injuries and was taken to hospital. It reminds me of what was written in a Fijian newspaper, where a pedestrian was accidently bumped by a motor car and died the next the day from the injuries. Hang on, it gets worse. Complicated by a vehicle crashing into parked cars and then hitting a pedestrian in the same area as the brawlers. So the car hit the pedestrian in the same spot on the body as the brawlers hit the other victims? I am tired. I am grumpy. I am sick of work. I am sick of Mother's manipulative behaviour. I am tired of being oldest son and the responsibility. I think Mother's neighbour has sent Mother a Fencing Notice, which Mother immediately Express Posted whatever it is to me. I will send it express post back to her on Thursday with R when he visits. Let me end on a happier note, the internment in a wall of our Late Friend's ashes. I could not go as I had to work. R went. R was chatting about this and that with our super rich acquaintance from Beacon Cover and his Indonesian partner. It turned out the Indonesian partner nursed the late and great Mirka Mora to her last days. He had no idea who she was but said she was just lovely and though suffering mild dementia, was also great fun. Hopefully Moaning Minnie Me will vanish for a time from tomorrow. C'mon, make me laugh. What is dupe paps about? I would guess it is not about pap smears. When our public transport works, it can work really well. 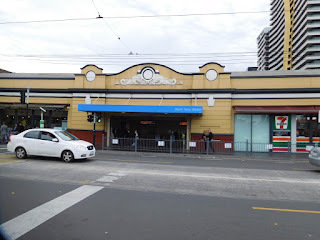 We crossed the road to the tram stop and caught the 58 tram to South Yarra Station and we had just missed a train, but with a ten minute Sunday service, we only had to wait eight minutes for the train to Oakleigh. 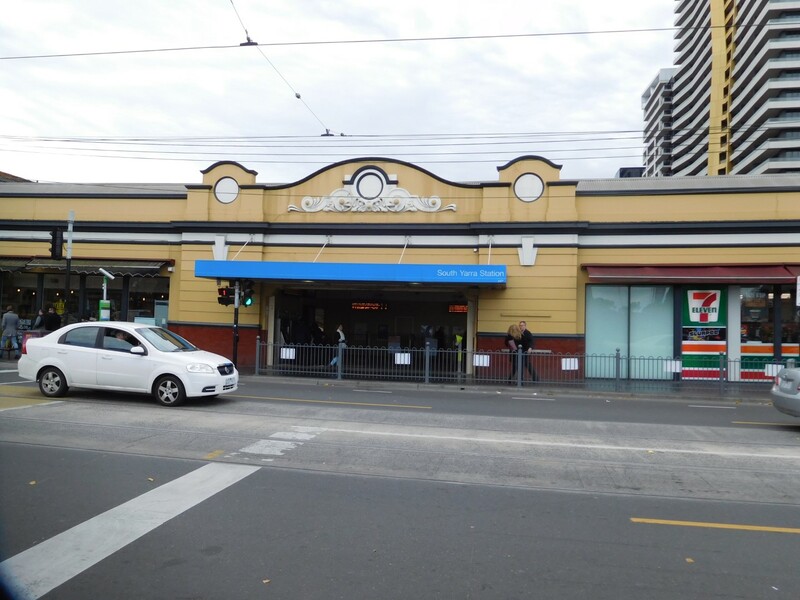 Express from South Yarra to Caulfield then up on skyrail for a few stations and we then descended to Oakleigh Station. Total time from our front door, about half an hour. Much the same as it would take to drive, but without the stress and parking hassles. Coming home was just as good. We headed straight up to the Sunday market, kicking multiple cigarrette buts into the gutter as we went. Boy, do people in in Oakleigh smoke a lot. We wanted to buy a few things. The fruit and vegetables looked especially good and we wondered whether they were home grown or not. I have ascertained from a Vietnamese born vegetable growing workmate that they are. I saw some ok looking socks and I am in need of some. Three pair for about $10. Look, said R, bamboo fabric socks. Ok, they are a bit dearer and we bargained down the price to $16 for three packs of three pair, or so I thought. The socks are extremely thick and there was only one pair per pack when I thought there were three pair. I fear I may have made a terrible mistake. The socks took forever to dry in the dryer today. Food, we want food. I knew where we would eat, but I pointed out to R a hotdog caravan, and another selling sausages in rolls, bratwurst, chorizo and others. In the 80s almost every Sunday we would go to Camberwell Market and browse and buy a flavoured sausage in a roll from the hottest blond bloke in a muscle tee shirt. We savoured his sausage for years. I can vividly remember the fine blonde hair on his arms. The bric and the brac at Oakleigh market did not interest us much. We feigned interest in a jug that was just a bit small to use as a milk jug. I did see some tech stuff, a Telstra dial phone and a Telstra push button phone. So good. One button redial for saved numbers. So easy to push the buttons multiple times when a number was engaged, or just press the redial button. But no, no cheap sausage for us today. We headed to the Eton Street Mall in Oakleigh for some good Greek food. I rarely sit in the sun but the breeze was cool and we did sit in the sun. It was warming, but if a cloud passed over the sun, it was suddenly cold. Unlike Hels and Joe on the same day, we did not ricochet between indoors and outdoors. 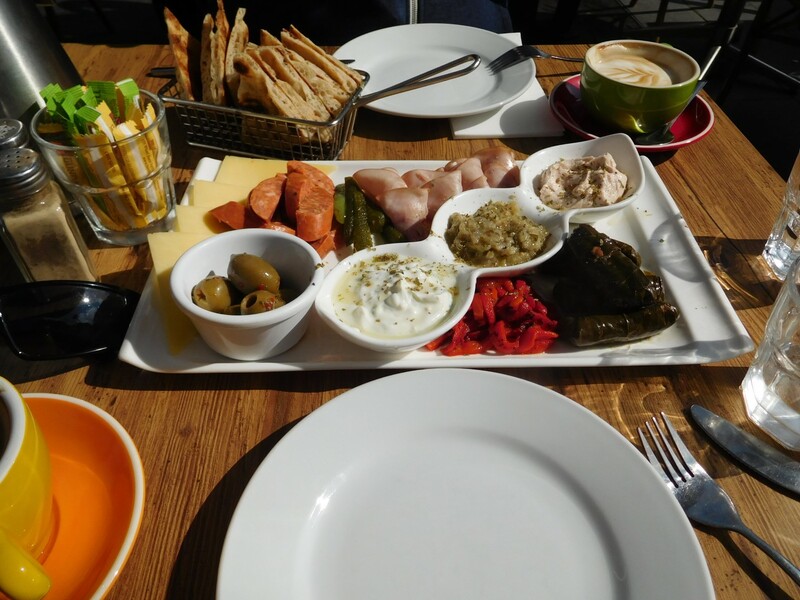 We shared a lovely mezze platter and the coffee was very good. The pita bread was quite filling and kept me going to until an R made spicy carrot cake for afternoon tea with a glass of milk. By golly the mezze platter was nice. This Sunday is rather different, with me working and buses replacing trains on the train line we used.